3rd video in the Sheepdog Training series. Aimed at sheepdog owners, its message is that a good farm dog can also be a competent trials competitor. 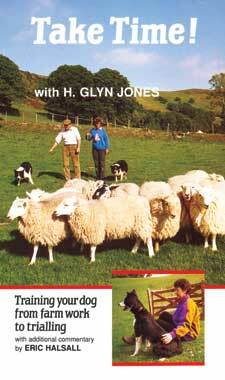 Glyn Jones uses two very different handlers and dogs as examples. Donna Jones is a shepherd in North Wales and her dog 'Zak' is one of several working with a large flock of sheep. In contrast, Marion Turner's 'Lynne' is kept on a smallholding in the south of England and is relatively inexperienced. Filmed in the scenic Welsh countryside. 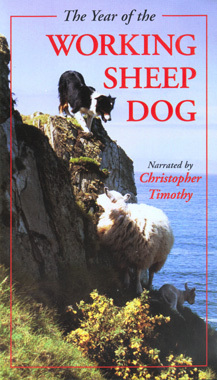 There are three videos in the Sheepdog Training series: Come Bye & Away; That'll Do; and Take Time. Videos sold seperately. 2nd video in the Sheepdog Training series. A follow-up to Come Bye! and Away!, this video deals with the second stage of sheepdog training. Glyn Jones now teaches the dog more specific commands and puts him through his paces as he learns to control sheep over a wide area, with reduced command contact. There are three videos in the Sheepdog Training series: "Come Bye & Away"; "That'll Do"; and "Take Time". Videos sold seperately. Behind the scenes look of rare and endangered animals & animal actors. Follows a 3 year old Clydesdale as he is trained to join a team for show. 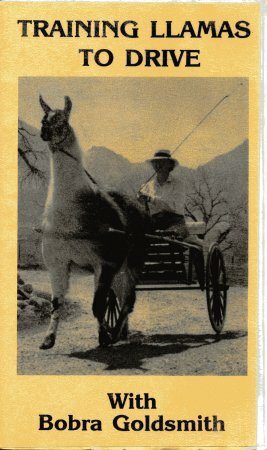 Covers: Preparing the llama for driving, fitting the harness for the first time, the first driving lesson, a technique for learning the touch of the reins, ground driving alone, introducing the llama to the cart, riding in the cart for the first time, driving alone with other llamas, introducing the llama to a new cart, & driving competition. VHS, Approx. 2 hrs. 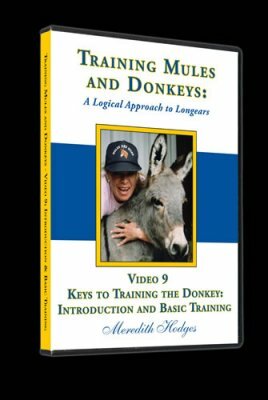 DVD: Pertaining to Mules. 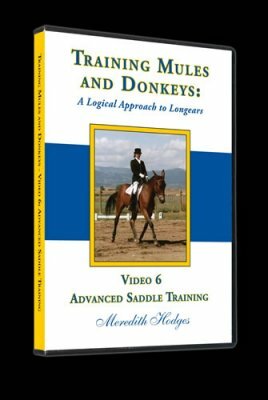 Differences between a horse & mule, undestanding your mule foal, handling, haltering, tying, leading, showmanship, trailer loading. Includes an electronic version (PDF file) of the corresponding Workbook, for viewing and printing from your computer. 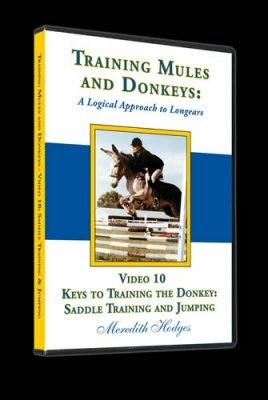 DVD: Pertaining to Mules. Covers safety basics, preventing and correcting bad habits, tack and training aids, restraint methods, introducing sheets and blankets, first saddling, lunging and ground driving. Includes an electronic version (PDF file) of the corresponding Workbook, for viewing and printing from your computer. 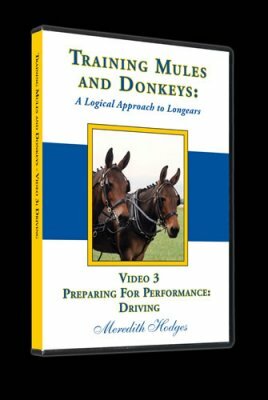 DVD: Covers an overview of equipment and proper fit for the harness, verbal commands, carts and carriages, pre-hitch training with an assistant, hitching to a training vehicle, reinsmanship, pleasure and obstacle driving, and working with teams. Includes an electronic version (PDF file) of the corresponding Workbook, for viewing and printing from your computer. DVD: Pertaining to Mules. Covers mounting, riding with and without an assistant, correct horsemanship, patterns at a walk and trot, the canter or lope, leads, seat and leg cues, more complex patterns and obstacles. Also includes sections on grooming and hoof care. Includes an electronic version (PDF file) of the corresponding Workbook, for viewing and printing from your computer. 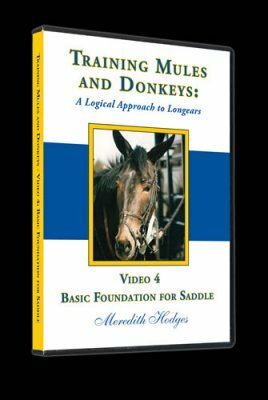 DVD: Pertaining to Mules. For fine tuning the rider: Covers equitation, equitation on the lunge line, riding a broke and a green animal without stirrups or reins, collection, bending, lateral work and simple lead changes. Also covers training tips for Western and English pleasure and trail classes. Includes preparation for the show ring, fitting and grooming. Includes an electronic version (PDF file) of the corresponding Workbook, for viewing and printing from your computer. 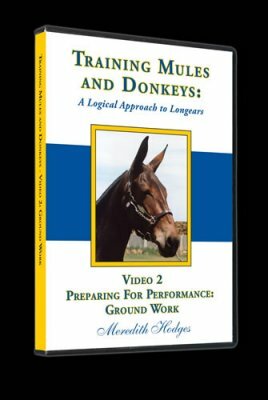 DVD: Pertaining to Mules. Introduces the curb bit and emphasizes the use of Dressage as a basis for all equine sports. With this foundation we undertake Second Level Dressage, Reining, Western Riding, Trail and Preliminary Jumping. Includes an electronic version (PDF file) of the corresponding Workbook, for viewing and printing from your computer. 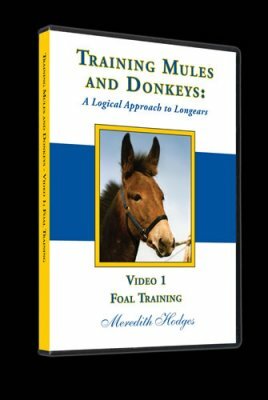 DVD: Pertaining to Mules. Introduces stadium and cross-country jumping including courses, equipment, types of jumps, correct rider positions and judging strides. Training segments include cavalletti and warm-up exercises, gymnastics, stadium jumping and course work and cross country. Here you will find tips on jump construction and much more. Includes an electronic version (PDF file) of the corresponding Workbook, for viewing and printing from your computer. 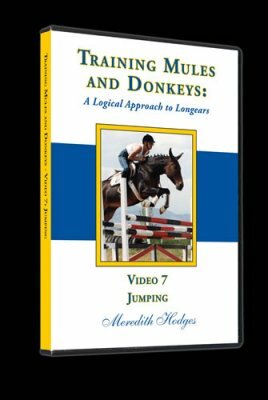 DVD: Pertaining to Mules. Covers shelter, feeding and nutrition, routine care, grooming, body clipping, braiding and advanced showmanship. Includes an electronic version (PDF file) of the corresponding Workbook, for viewing and printing from your computer. DVD: Pertaining to Donkeys. 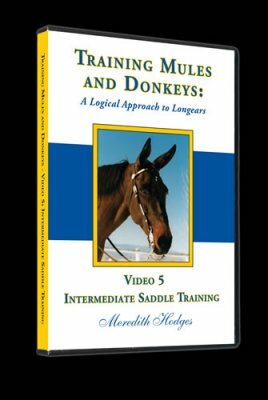 Covers differences between training mules and training donkeys, imprinting, tying and leading, trailer loading, showmanship and measuring for athletic potential. Also covers jacks: training to breed in hand. Includes an electronic version (PDF file) of the corresponding Workbook, for viewing and printing from your computer. DVD: Pertaining to Donkeys. Covers basics in the roundpen including trotting, mounting, patterns and obstacles, the canter, lateral training, lengthening and jumping. Also, massage for your equine. Includes an electronic version (PDF file) of the corresponding Workbook, for viewing and printing from your computer. 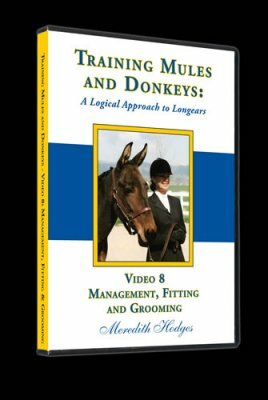 Workbook which corresponds to Meredith Hodges' Videotapes #8 (Management, Fitting, Grooming), #9 (Intro to Donkey & Basic Training), #10 (Keys to Training the Donkey). Gives detailed instruction for the Obeisance, Bow & Kneel. 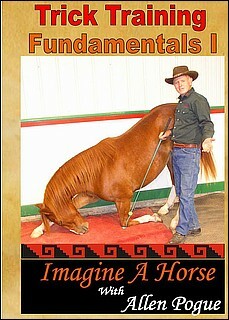 It shows systematically how to prepare the horse mentally & physically to accept discipline required for these moves. Imagine A Horse methods are always horse friendly & humane. Running Time 52 min. This beautiful crafted video catches the year of the sheepdog and shepherd as it has never been filmed before. Taken along the most spectacular coastline in Britain on the Atlantic Ocean. Birth and progress of the pup, magic of the mid Summer dawn gather and theres a sheepdog trail. Working with his team of skilled sheepdogs, he looks after a flock of 800 ewes together with 1200 lambs. This is one of the most exciting videos ever produced on the border collie. A video look at several animals in different zoos. A variety of baby animals as observed in several zoos with information about the babies.